Today I’m sharing my super easy sausage casserole recipe, the complicated version is also included at the end. I hope you enjoy it. We love it on a cold evening. This is one of the easiest casseroles you are ever going to make. 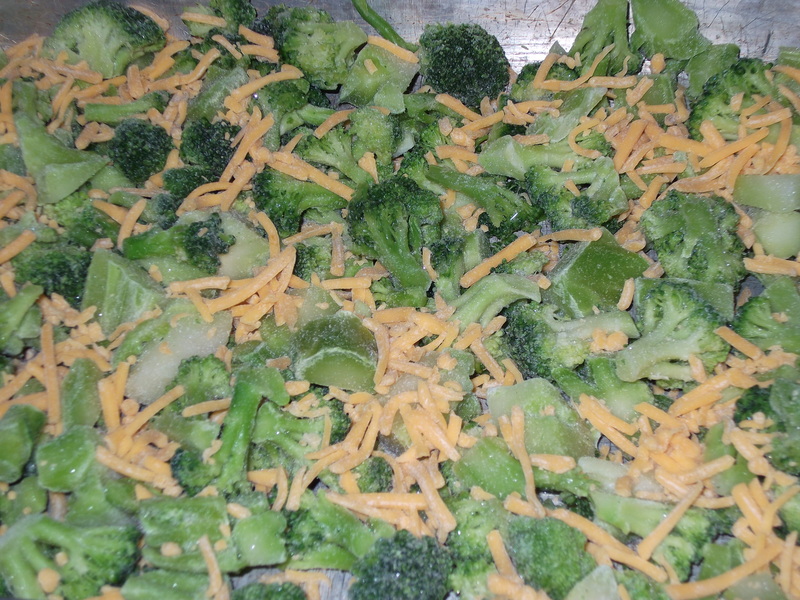 Step 1: dump the frozen broc into the baking pan and spread it out nice and evenly. Sprinkle with 1/2 C of the cheese. 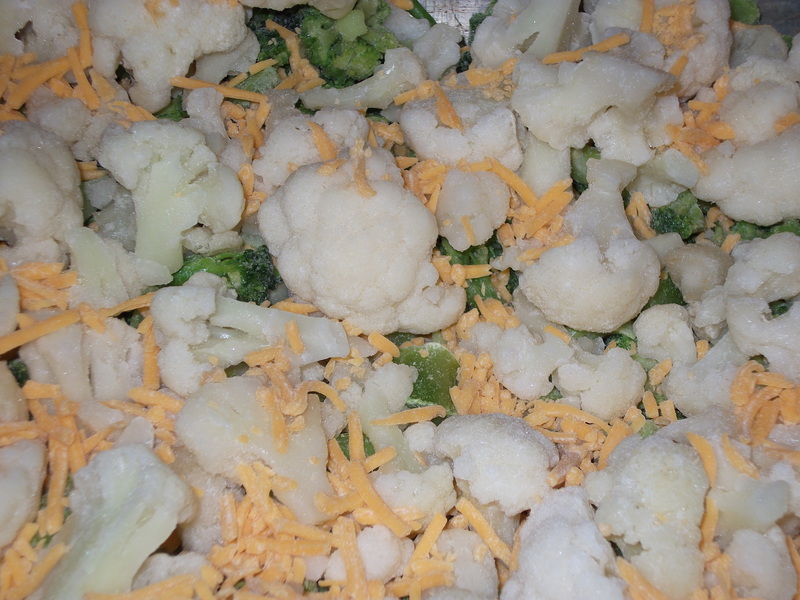 Step 2: dump the frozen cauliflower on top of the broc and spread it out evenly also. Sprinkle with 1/2 C of the cheese. Step 3: slice up the half stick of oleo and dot all over the veges. Step 4: Slice up the sausage into bite size bits. 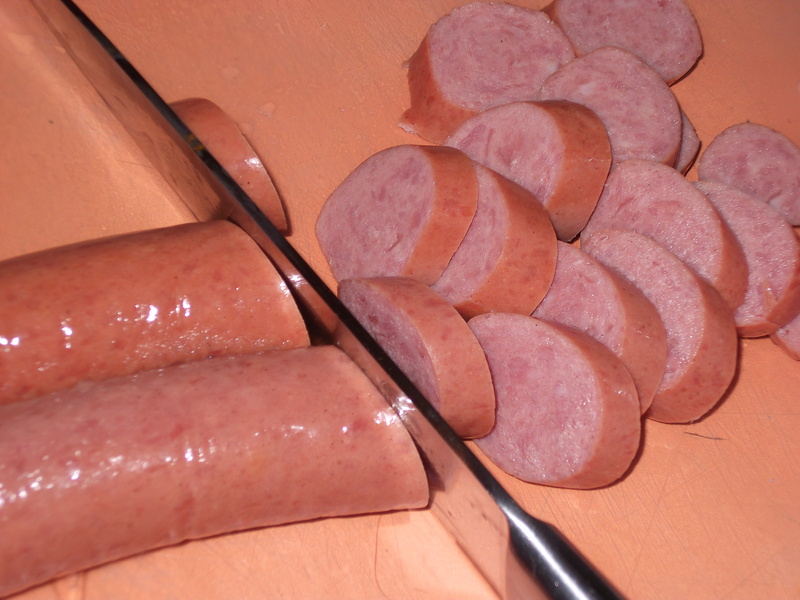 Step 5: spread the sausage slices across the top. Sprinkle with the rest of the cheese. Step 6: Pop the pan, covered with foil, into a 375F oven and bake at least an hour. It’s done when the cheese is all nice and melty and you are starting to think the veges might dry out. 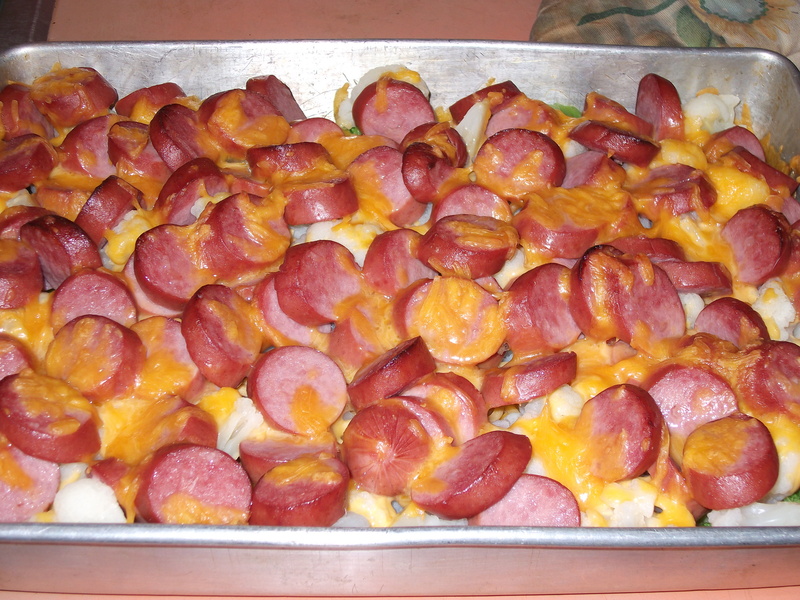 If you want a silghtly more complicated version I sometimes add turnips to this casserole in place of the cauliflower. To do this you need to peel and cut up 1 lb of turnips. Boil the turnip until they just start to soften and drain them VERY well before adding them to the casserole. You’ll also want to increase the broc by 1/2 a lb. 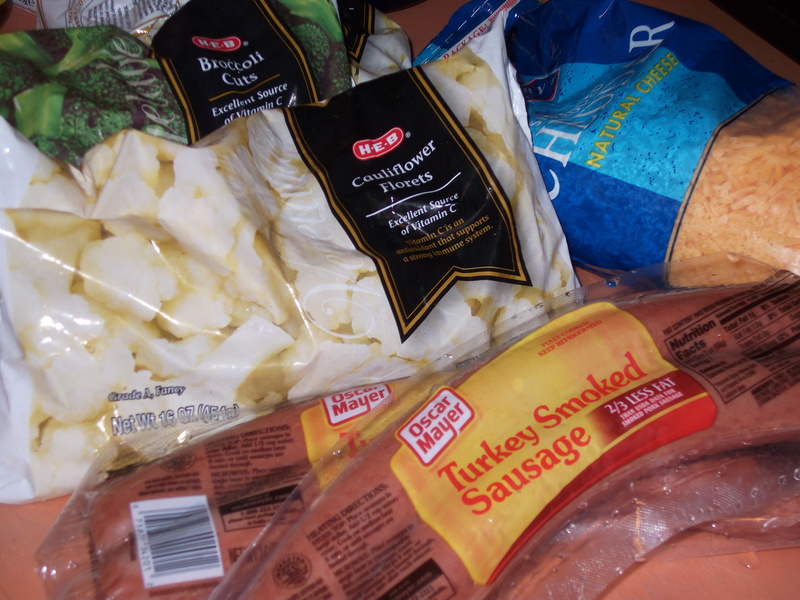 Some days I add more cheese, some days I use more broc. 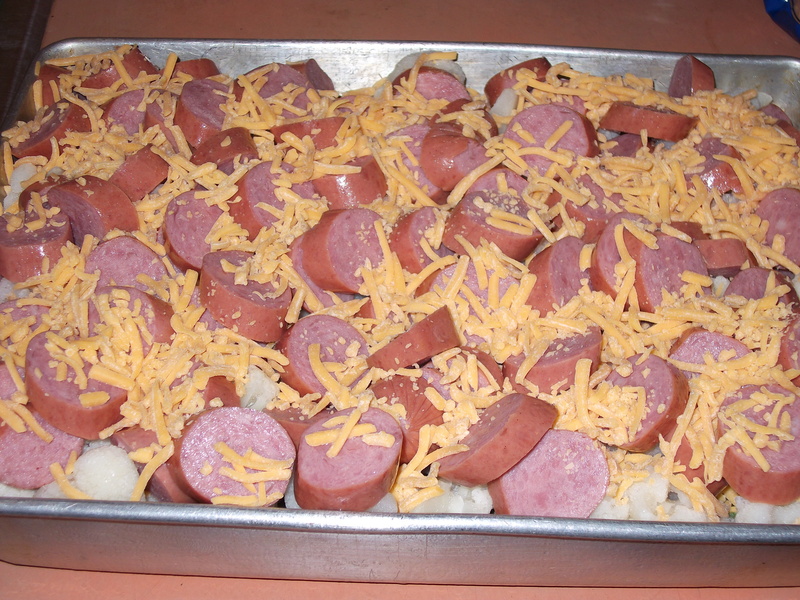 It’s an easily varied casserole and requires almost no brain at the end of the day to toss together so it can bake while you relax with a stiff drink and a quick bubble bath. I plan to test that theory just as soon as I get a bathtub again so don’t quote me on it yet. Obviously the food in the bowl is from one of the batches with more cheese. If you aren’t so picky about your carb count and you have no shredded cheese on hand you can also open a small can of cheddar cheese sauce to use instead. I’ve done that in desperation and it tasted good. My coffee is gone so I am off to do some yoga while my chicken soup thaws. We got a REALLY good rain a couple days ago so I get to skip watering my maters again this morning. Since I really wasn’t looking forward to going outside of my nice warm house I consider this a good thing. I picked up Fast Lane Stuff & Late Night for my sims while I was out monday, finally installed them on wednesday, spent several hours thursday in testing to be sure my game wasn’t going to implode on me again and today <friday> I’m building a new town. I made copies of all the new high rises, res & comm, so I can use them wherever I want. I really like the SV map so will be building there. I already tried the RV map and none of the lots on the island are big enough for a high rise <sigh>. I plan to use nothing but EA built residential lots in my new town, which I’m calling Dusty City. I will build a lot of the commercial venues myself though. This should keep me busy for a while. I’m having some minor boot issues so will be tearing down the pc soon to install the other HD which means I will have to do a clean install on everything. Testing all my progs will prolly take a week after the new install. 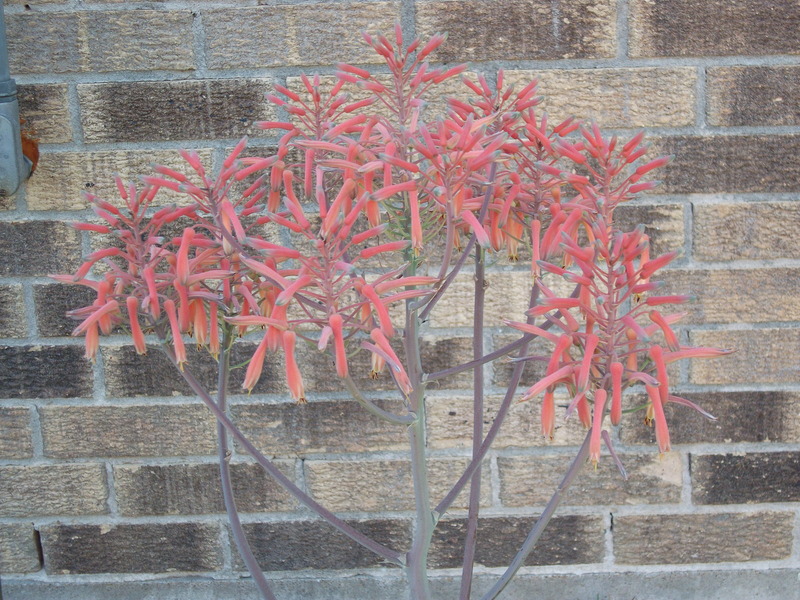 I’ll try to remember to warn you when I go off line. 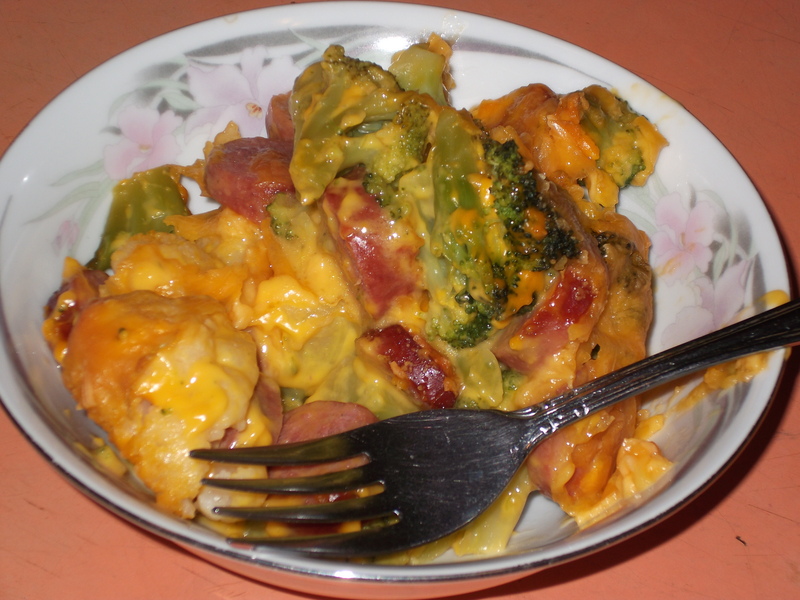 This entry was posted in Low Carb, Meats, Phase 1, Recipes and tagged Broccolli, Cauliflower, Turnip. Bookmark the permalink.